Add some excitement to your playset with the all new Flex-Arch Ladder. Children can build strength and confidence with the unique design that offers 4 ways to install and climb. The flexible two-piece design allows for the ladder to be a full arch (up or down) or multi-curve (2 ways) configuration. The ladder can be attached to a wood play deck from 48 in. to 60 in. high. For added security, installation features fun-shaped, bolt-through brackets and an in-ground anchor for extra stability. The product includes all hardware, fasteners and instructions for complete assembly. Based on the existing deck construction, additional wood (sold separately) may be required to meet ASTM safety guidelines on certain ladder configurations. Unique design that provides 4 ways to assemble and climb and can be mounted on deck heights from 48 in. to 60 in. Wood Swing Sets from Creative Cedar will encourage hours of active, engaged playtime with a variety of activities in your own backyard. Sky View wooden swing set features swings for up to four at one time, kids picnic table and 15 sq. ft. sand box with a swing set ladder and climbing wall to reach the raised, rectangular play fort with tarp canopy and race down the 8 ft. wave slide. Swing set kits include pre-cut, pre-drilled cedar swing set construction, swing set accessories and installation hardware - everything you need to create the perfect play-safe swing set experience in a single day. Standard Metal Swing Hangers from Creative Cedar Designs can be used to install a variety of swings on most residential swing sets. Securely fasten your swings in just a few minutes, knowing your child will have a safe, quiet backyard swing for years to come. Swing hangers come packaged in set of 2 with mounting hardware and installation instructions. Heavy Duty Swing Hangers from Creative Cedar Designs allow you to hang swings with confidence, knowing that your swing set hardware is securely fastened for years to come. Solid cast construction of swing hangers designed to provide peace of mind through years of playtime and exposure to the elements. Heavy duty swing hangers come packaged in set of 2 with all necessary mounting hardware and illustrated installation directions. Flex-Arch Playset Ladder Add some excitement to your playset with the all new Flex-Arch Ladder. Children can build strength and confidence with the unique design that offers 4 ways to install and climb. The flexible two-piece design allows for the ladder to be a full arch (up or down) or multi-curve (2 ways) configuration. The ladder can be attached to a wood play deck from 48 in. to 60 in. high. For added security, installation features fun-shaped, bolt-through brackets and an in-ground anchor for extra stability. The product includes all hardware, fasteners and instructions for complete assembly. Based on the existing deck construction, additional wood (sold separately) may be required to meet ASTM safety guidelines on certain ladder configurations. 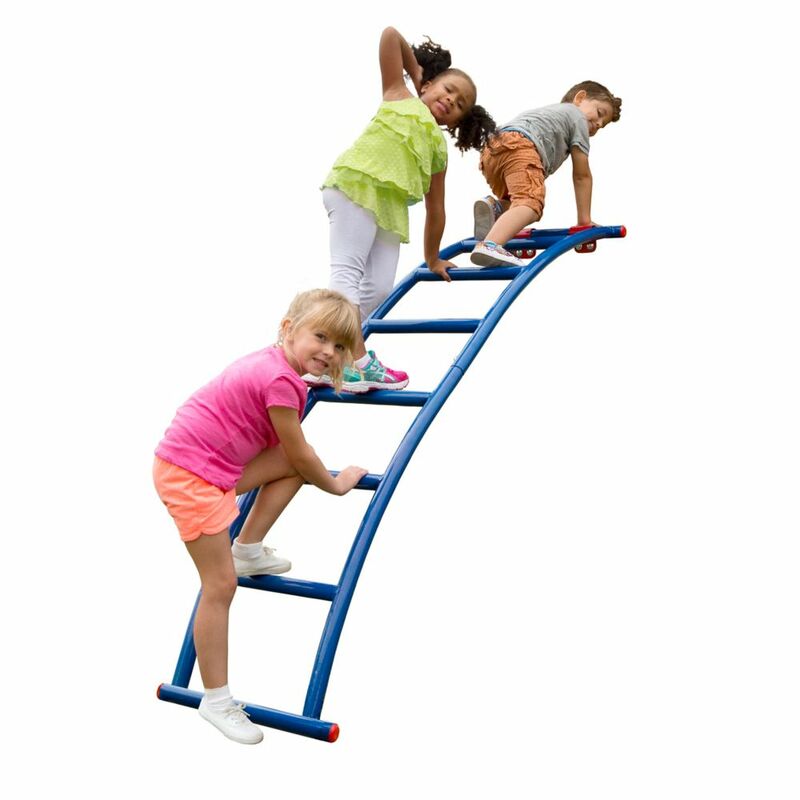 Flex-Arch Playset Ladder is rated 4.8 out of 5 by 16. Rated 5 out of 5 by Justin from Awesome fit!... Awesome fit! Rated 5 out of 5 by GiginMi from Very nice adults (120-250 lbs) and kids have enjoyed! Very nice adults (120-250 lbs) and kids have enjoyed! Rated 4 out of 5 by Nunny from Solid ladder The ladder was what we expected unfortunately one of the end caps of the tubular construction was broken . Rated 5 out of 5 by Stephen from Exellent quality, heavy gauge metal should hold up for the... Exellent quality, heavy gauge metal should hold up for the long haul. Very easy to assemble. Granddaughter loves it. Rated 5 out of 5 by HomeDepotCustomer from Kids love it and so do we!... Kids love it and so do we! Rated 5 out of 5 by Rmiller from Fantastic So pleased with this ladder. Looks great and my kids just love it! Wow is it built well. Great hardware accompanying it as well. Worth every penny!! Wish I could post a photo but it won't let me! It looks fantastic on our play centre.